An old friend of mine ... Mike B., from North Carolina, mentioned to me that he had two GPS systems for his big rig truck that were broken. He depends on these to do his job, and the loss of the more capable GPS was really making his life difficult. In both cases the necessary repair involved soldering tiny little parts. The more capable GPS had a surface-mounted mini-USB connector that needed replacing; the other a resistive touch screen that needed to be soldered (flexible PC to flexible PC). I have the right tools to do the job, and perhaps hands that are a bit steadier. So I had him ship the two GPSs to me. Working yesterday and this morning, I was able to repair them both. Some specialized tools really helped a lot. 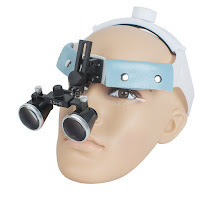 I have a head-mounted pair of 3.5x binoculars (designed for surgeons and dentists, much like the ones at right); these gave me a nice, clear view of the work. I'll bet I looked pretty weird while wearing these! My Hakko desoldering iron (with built-in vacuum) nicely desoldered the old parts. Finally, my Hakko soldering iron with a 0.03" diameter tip let me solder the new parts on. I don't mean to say that it was all easy because of the tools, though – there might have been a bit of non-Mormon approved language as I struggled to get all the pieces in place and hold them there while soldering. Removing the old mini-USB connector was a challenge mechanically. My finest solder was twice the diameter of the work piece, making it a real challenge to get solder only where it belonged. And both circuit boards had taken some hits, with traces lifted during both the current and previous repairs. Those had to be repaired with wire jumpers.